ARTBA Chairman Nick Ivanoff, president and CEO of Ammann & Whitney, spoke September 19 at the Long Island Contractors Association (LICA) “Infrastructure Investment Summit,” which brought together elected officials and top highway superintendents from Long Island’s 24 largest municipal governments to discuss local infrastructure issues. Ivanoff stressed the importance of finding a long term revenue fix for the federal Highway Trust Fund, as well as the need for increased transportation investment at the state and local levels. Past ARTBA Chairman (2009) Larry Tate, product director at Caterpillar, Inc., was also on hand and provided insights into how infrastructure conditions impact the ability of companies like his to move products and how local transportation investment can impact global competitiveness. 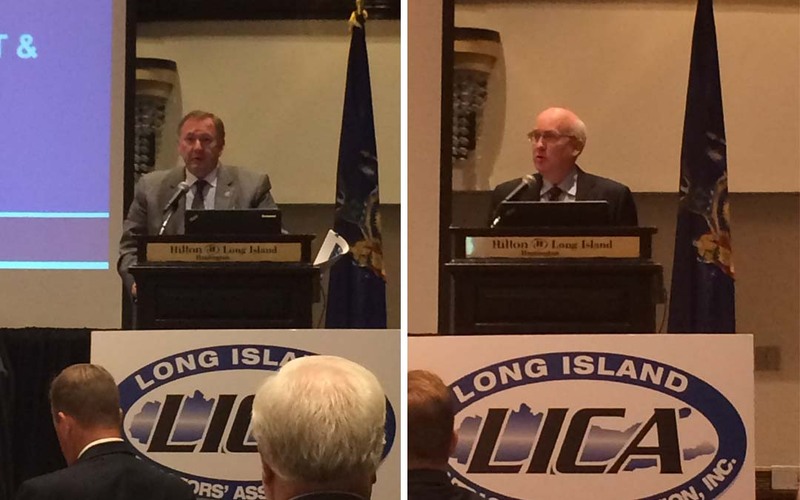 LICA officials used the event to unveil new poll results gauging the views of Long Island residents about road and bridge conditions. Among the key findings: 84 percent believe good roads are essential to job growth and strong property values; 90 percent said roads and infrastructure are essential services of local government; and 65 percent said they would consider voting against an elected official who intentionally doesn’t repair roads.